by Jay Lowder, Christian Broadcasting Company, 10/27/18. … In Judges 7, as Gideon is preparing to battle the Midianites, God makes it clear He wants the Israelites to credit Him for the victory. So, God decides to wean Gideon’s army. The first cut? Any man who is afraid (Judges 7:3). With that, 22,000 men packed their bags and went home out of fear. by ABIGAIL GEIGER , Pew Research Fact Tank, 4/14/17. … Here are five key facts about Americans and their holy texts. 2 Three-quarters of Christians say they believe the Bible is the word of God. Eight-in-ten Muslims (83%) say the Quran is the word of God, according to the 2014 survey. 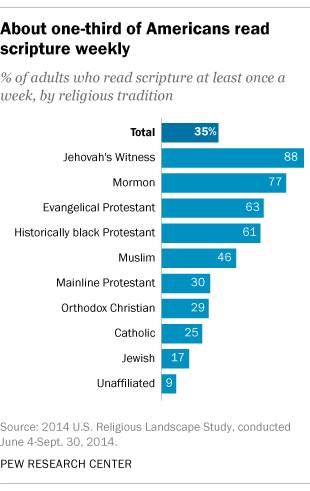 Far fewer Jews (37%) say they view the Torah as the word of God. 3 Christians, who make up a majority of U.S. adults (71%), are divided over how to interpret the Bible. While about four-in-ten Christians (39%) say the Bible’s text is the word of God and should be taken literally, 36% say it should not be interpreted literally or express another or no opinion. A separate 18% of Christians view the Bible as a book written by men, not God. 4 In 2014, about four-in-ten Christians (42%) said reading the Bible or other religious materials is an essential part of what being Christian means to them personally. An additional 37% say reading the Bible is important but not essential to being a Christian, and 21% say reading the Bible is not an important part of their Christian identity. 5 Seven-in-ten Americans (71%) know the Bible teaches that Jesus was born in Bethlehem. A similar share know that Moses was the biblical figure who led the Exodus from Egypt, and 63% could identify Genesis as the first book of the Bible, according to our 2010 religious knowledge survey. But fewer than half of adults (45%) could name all four Gospels (Matthew, Mark, Luke and John), and only four-in-ten (39%) identified Job as the biblical figure known for remaining obedient to God despite extraordinary suffering. “I have a special concern for you church leaders. I know what it’s like to be a leader, in on Christ’s sufferings as well as the coming glory. Here’s my concern: that you care for God’s flock with all the diligence of a shepherd. Not because you have to, but because you want to please God. Not calculating what you can get out of it, but acting spontaneously. Not bossily telling others what to do, but tenderly showing them the way. When God, who is the best shepherd of all, comes out in the open with his rule, he’ll see that you’ve done it right and commend you lavishly. And you who are younger must follow your leaders. But all of you, leaders and followers alike, are to be down to earth with each other, for— God has had it with the proud, But takes delight in just plain people. by John Paul Thompson, Ph.D. Presentation given to the Fellows of the Billy Graham Center for Evangelism, Wheaton College, 12/19/17. When Jesus used the planting/sowing metaphor the object planted was “the word” (Mark 4:14), “the word of the kingdom” (Matt. 13:19), “the kingdom of heaven (Matt. 13:31) or the sons of the kingdom (Matt. 13:24, 37). When Paul declared, “I planted, Apollos watered, but God was causing the growth,” (1 Cor. 3:6), he is referring to planting the gospel, not planting local chruches. Irenaeus, in 180 AD, coined the phrase church planting when he wrote, “the Church is planted like the Garden of Eden in this world.” He was speaking of the institution of the universal Church, not of local congregations. Paas insightfully pushes back suggesting a return to the three stages without rushing to the third stage. He suggests the the third stage is not always needed in communities that already have churches. He challenges church planters to consider working with exiting churches. Church planters could focus upon planting and gathering, encouraging new followers of Jesus and their gathered groups to become part of already established churches in the community.